On the eve of the HKS AGM a meeting was held with the President and Chair of the Society at which the role of HKS in supporting membership growth and the Society’s annual conference on Linguistics and Language Studies were discussed. At the AGM and annual luncheon the following day, Ann Carlisle gave members in attendance an update on key CIOL activities and Jane Galbraith encouraged all eligible members to seek chartership and to join CIOL’s campaign to raise professional standards. The key messages were well received and supported by HKS. 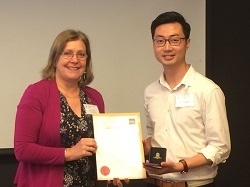 Following the presentations, Ann Carlisle was delighted to present the award for the best candidate performance (in Hong Kong) for the Diploma in Translation to Hin Pan Or. Moving to Shanghai, the focus on this part if the trip was the China Association’s second AGM, hosted by Fudan University. Professors from a number of local universities were in attendance along with a selection of students who had participated in the first CIOL China Association Translation competition for postgrads studying the Masters in Interpreting and Translation (MIT). Over 600 students entered the competition and a number of awards were made to recognise the highest achievers. The CIOL China Association is using the competition to raise awareness of the Diploma in Translation and professional membership. 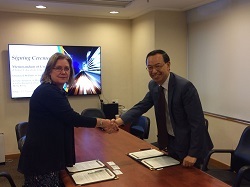 Following the AGM, CIOL representatives continued with a series of university visits they undertake each time they are in China during which they meet faculty staff, present lectures to students and explore possible opportunities for collaboration. This time we met with Shanghai Lixin University of Accounting and Finance including the Dean of the School of Foreign Languages Professor Tu Liping after which Ann Carlisle and Jane Galbraith addressed approximately 100 first year students studying either English or Japanese. The visit concluded with a meeting at the University of Nottingham’s campus in Ningbo, complete with a replica of the Trent Building.